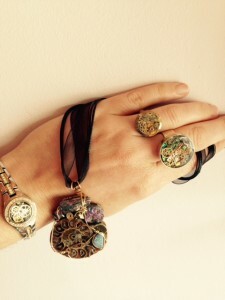 Recently we had a chance to talk to Kirsten Verhofstadt, the designer behind Kirka Creates, and she explained how she brings to life her vibrant pieces that have a definite steampunk flair with a refined, confident elegance. Like many other designers who incorporate used pieces and parts, Kirsten always has her eyes open for that special something that she can bring into her work. In this search she is incredibly resourceful and not afraid to use a little force! She said that at times she’ll even use small tools to pry apart watches and smash open other gadgets. Most importantly, Kirsten has a system that allows her to organize the chaos. 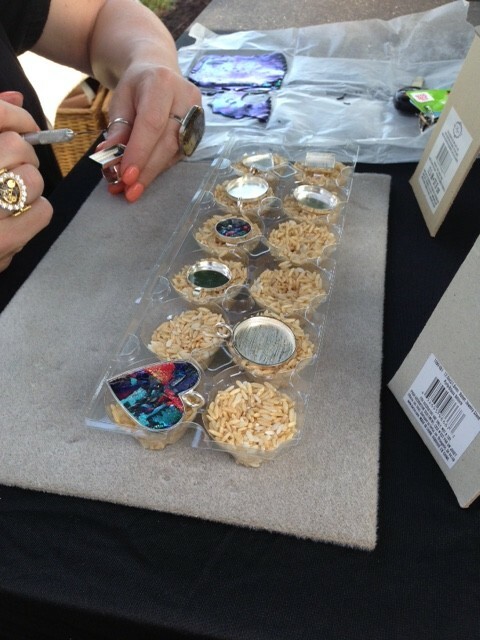 Kirsten uses little trays of rice to balance her pieces while she uses tweezers to individual place each tiny piece. When asked how she comes up with her designs, Kirsten said that she simply focuses on making jewelry that she would want to wear, and she certainly is a wonderful model for her line! If you are looking for a statement piece that will get you noticed, visit us at Arts & Letters to see more from Kirka Creates.